Displays and stores your Minecraft objects in cabinets of all kinds of materials and colors. Cabinets 1.8 and 1.8.8 is a mod that lets you create cabinets from a lot of materials such as wood, stone, clay, wool, iron, gold, diamond, and so on, in addition to variants of each material, ie, woods of different colors, different types of stone, colored clays, etc. Which in total create 57 cabinets. These cabinets have the same capacity that crafting table, ie, capacity 9 boxes. Unlike a chest, with cabinets see the content and serve to decorate and store items. Cabinets are made up of three shelves or departments where we can put anything we want. Furthermore we can put glass doors to our cabinets, doors that act as if they receive a redstone signal. 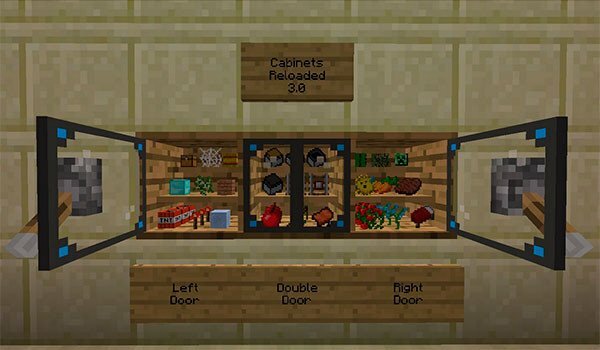 How to install Cabinets Mod for Minecraft 1.8 and 1.8.8? Double click to the downloaded file to run the Forge installer. Paste the mod downloaded file inside of .minecraft / mods folder. Cabinets of all kinds of colors and materials!